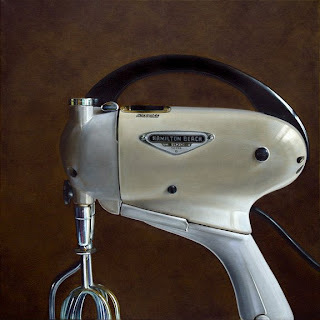 I finally finished up the latest Hamilton Beach Mixer, which I plan to offer to Stricoff Fine Art. I have now moved on to the next piece. Karen had been on my case lately to paint another loaf of bread, and Wynne Falconer recently expressed a desire for another pb&j, so I've got a new composition going which incorporates both of those elements. It's been a while since I've done a loaf of bread in cellophane, and it feels good to have one on the easel. I just completed my second day on it, and so far it's coming along nicely. I think I was biorhythmicly ready to do this particular painting. 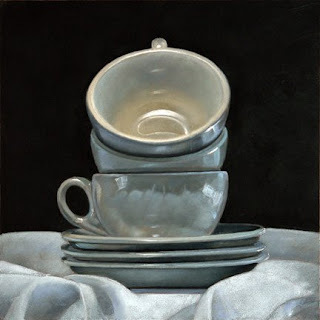 The final ebay painting for this week, is the third in what has become a series of stacked coffee cup paintings. Now it's back to the big mixer, which I hope to complete in the next day or two. That one has been a real bear, and I'm just keeping my fingers crossed that it will work out. If you'd like to bid on the cups above, you can access the auction by clicking here. I picked up this electric tea kettle on ebay a while back, and took a bunch of photographs, but haven't got around to painting it until now. I've selected a few good compositions from that lot for larger paintings, but thought I'd debut it here on ebay as a six by six. 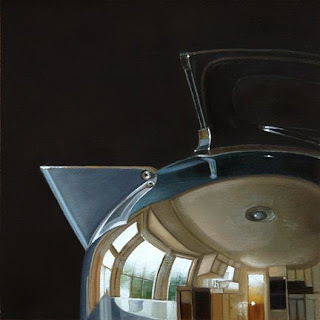 As you can see the kettle has this great dome shape, perfect for reflecting its' surroundings. Plus it has a wonderful decoesque handle. I'm pretty happy with how this turned out. I think this is a good start, and I'm looking forward to painting it again on a larger scale down the line. If you'd like to bid on this piece, you can take part in the auction by clicking here. 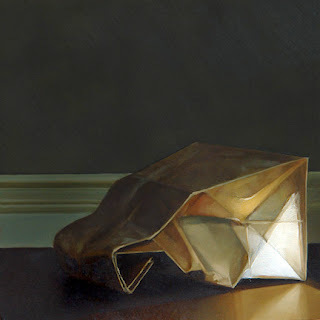 I have to admit that this particular painting was done strictly for pleasure, with no regards as to its' marketability. 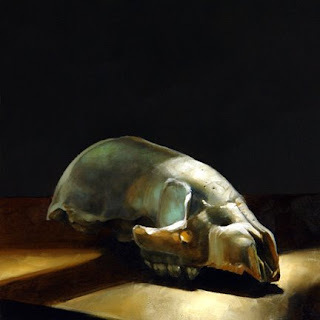 This little skull was used in one of the Chicago commissioned paintings, and I just wanted to paint it again. Skeletons are so beautiful to me, and as I have found out, really fun to paint. This is the third one I've done so far, and it was a real treat. I inherited this skull from Jeff and Leslie Cohen a number of years ago, and it resides on our bookshelf with my modest collection of artifacts from the natural world. I can't say for sure what animal it came from. I'm tempted to say that it was an Opossum, but I'm not positive. If there are any zoologists out there that can identify it, let me know. 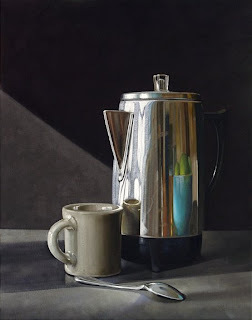 So, if you are one of those who is drawn to this type of subject, and would like to bid on this painting you can access the auction by clicking here. Working on this little painting took me back in time to my early days on ebay. 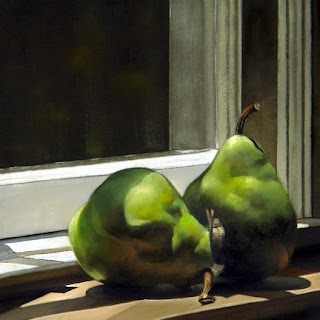 While updating my website recently, I rediscovered many of my early ebay pieces, and they made me realize how much I missed those brightly lit pieces of fruit on the bench near our bay window. So, I decided to return to my roots, and paint a couple of sunny pears. I had forgotten how much fun it was to sink your paintbrush into a juicy pear. I decided to hang the big mixer up on the wall for a week. Let it dry following the second pass, and while that process is taking place, do a few ebay paintings. I know that I'm taking too much time on this mixer painting, but I want to get it right. After the first layer was complete for each of the five ebay paintings, I picked up on a subtle running theme. All but the final painting used the same color palette. This may be a good thing, or it may not. Nonetheless, that's how it worked out. I'm really drawn to "earthy" colors, ie. variations of olive green, browns and dark reds. I hope this weeks posts won't appear too redundant. I believe the variety of subject matter may help tone down the accumulative effect of those repetitive colors. If you'd like to bid on this painting, you can access the auction by clicking here. It's not unusual for me to go a week or more between blog posts, but this week scheduling was totally out of my control. Earthlink, in an attempt to correct some billing errors originating at their end inadvertently disconnected my internet service. I knew that "disconnection" was the most likely cause of my troubles, since the loss of service came about minutes after Earthlink took care of my problem. Having no other recourse to regain my service, I entered into the bowels of intercontinental tech support. Five days, multiple calls over seas, hours spent following cryptic unintelligible instructions, and several "live chats", accessed via the free wi-fi at my local coffee shop, they came to the conclusion that I needed a new modem. I was convinced that this was not the problem, but having reached the end of my rope, I agreed to have the modem shipped. The following day I received a call from tech support stating that they had discovered the problem. They had accidentaly disconnected my service at their end, but they were happy to report that our account had been reestablished, and that we should be back online. We were. The next day our new modem arrived. While all of this was going on I took a break from the large mixer I've been working on to let the first layer dry, and returned to the painting above. I had started this well over a year ago, but never completed it. I thought, "maybe this would be a good time to finish this up". I hadn't worked on one of the old percolators in a while, and it was kind of a blast from the past to do one again. I haven't decided where it will go just yet. I'm trying to build up a store of paintings then figure out where they all should go. I've also been working on some new ebay paintings. I've got the panels cut, primed and the drawings transferred. Once the big mixer is complete I'll get going on them. I plan to follow those with a pb&j slated for Wynne/Faconer. We'll see how it goes. This is my plan, as of today.